February 8, 2011- A man who conspired to import cocaine and marijuana into the United States by concealing the drugs in commercial airlines was sentenced to 20 years in prison, following an investigation by U.S. Immigration and Customs Enforcement's (ICE) Homeland Security Investigations (HSI). David Christie, 44, of Montego Bay, Jamaica, was convicted by a federal jury in February 2010, following a 7-day trial. According to court documents and evidence introduced at trial, Christie supplied large quantities of drugs that ended up for sale in major U.S. cities including New York. HSI's investigation revealed that Christie and his co-conspirators had two primary methods of smuggling cocaine and marijuana. 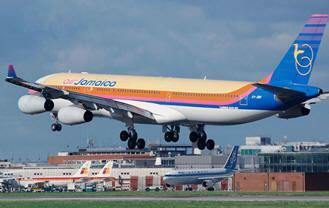 Both involved hiding the narcotics on aircraft originating at Jamaica's Montego Bay Airport for retrieval and subsequent distribution in the United States. The first method involved stashing the drugs beneath the aircraft's toilet. Once the plane landed in the United States and cleared customs, a co-conspirator would board the plane for the next leg of the trip. During the flight, the co-conspirator would retrieve the hidden narcotics from the bathroom. Because the plane had already cleared customs, this individual was not subject to search upon exiting the aircraft. Another method of concealment involved hiding narcotics behind panels in the cargo section of airplanes departing Jamaica. Once the flight reached the United States, the co-conspirators would use baggage handlers employed by various airlines to remove the drugs and give them to other members of the organization. The drugs were subsequently distributed to Christie's customers in New York. "This investigation led by dedicated HSI special agents in New York resulted in a lengthy prison sentence for a defendant who ignored our nation's drug laws and disrespected our country's borders," said James T. Hayes, Jr., special agent in charge of ICE HSI in New York. "We will continue to aggressively investigate this type of crime to deter this type of illegal activity in the future." Over the course of the conspiracy, Christie imported more than 150 kilograms of cocaine and more than 100 kilograms of marijuana using these methods. In addition to the prison term, Christie was sentenced to five years of supervised release and ordered to forfeit over $3 million. HSI was joined in this investigation by the Drug Enforcement Administration and U.S. Customs and Border Protection. DOT Secretary Views On ?The Future of Aviation In America?